Asher Sharp is willing to give up everything for what he believes in. Except his son. In the aftermath of a flood that washes away much of a small Tennessee town, evangelical preacher Asher Sharp offers shelter to two gay men. In doing so, he starts to see his life anew--and risks losing everything: his wife, locked into her religious prejudices; his congregation, which shuns Asher after he delivers a passionate sermon in defense of tolerance; and his young son, Justin, caught in the middle of what turns into a bitter custody battle. With no way out but ahead, Asher takes Justin and flees to Key West, where he hopes to find his brother, Luke, whom he’d turned against years ago after Luke came out. And it is there, at the southernmost point of the country, that Asher and Justin discover a new way of thinking about the world, and a new way of understanding love. In this stunning literary page-turner about judgment, courage, heartbreak, and change, bestselling author Silas House wrestles with the limits of belief, and with love and its consequences. Silas House is the author of five novels. His book for middle-grade readers, Same Sun Here, was a finalist for the E. B. White Read-Aloud award. A frequent contributor to the New York Times and a former commentator for NPR’s All Things Considered, House is a member of the Fellowship of Southern Writers and is the winner of the Nautilus Award, the Appalachian Writers Association's Book of the Year, and other honors. “An urgent and beautifully written literary thriller about a man on the run that explores themes like the pain of atonement and the necessity of reconciliation, being published at a time when understanding across cultural and political divides seems wider than ever." "Silas House's characters are as real to me as my own family. 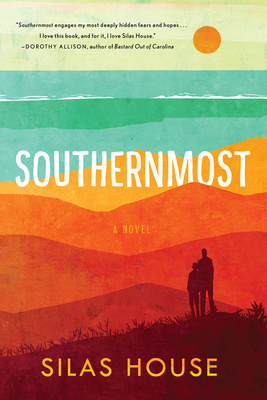 Southernmost is a novel for our time, a courageous and necessary book." "This contemporary spiritual journey is also a love story and a classic road novel—a chase—filled with unrelenting suspense all the way. I have to say honestly that toward the end, you literally cannot put it down (well, you can’t put it down at the beginning, either!) as Southernmost moves from the flood-ravaged mountains of Tennessee down the eastern seaboard to the exotic locale of southern Florida. Perhaps because the cast of major characters is small, the degree of character development in this novel is extraordinary, from doubt-torn Asher, his rigid wife and loving granny Zelda back home in Kentucky; to Key West innkeeper Bell, an enormous woman in a muu-muu, a great cook and piano player extraordinaire with her own secrets; to her mysteriously sad and beautiful helper Evona who tends the jungly trees, plants, and flowers; to the most interesting of all, 9-year-old Justin who turns out to be a very unusual child, an old soul and mystic himself. With its themes of acceptance and equality, Southernmost holds a special meaning for America right now, with relevance even beyond its memorable story." “Southernmost is an emotional tsunami. The classic themes of great literature written about family life are upended here in a modern twist as a father and son flee one life in search of another; as estranged brothers separated by time and their judgement of one another seek redemption and through the women in their lives, antagonists in the struggle who become grace notes on the road to redemption. This is a story of faith lost and love found, and what we must throw overboard on the journey in order to keep moving. A treasure." "[House] writes much like fellow Kentuckian Robert Penn Warren, in lyric prose that seems on the verge of poetry. Southernmost is a novel with a heart, but it also makes readers think."